I may live in Tennessee now, but I lived a full 22 years of my life as a Kentuckian. 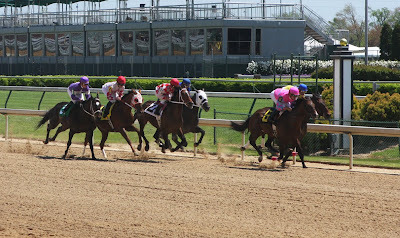 You can’t live in Kentucky, and not be aware of the Kentucky Derby! 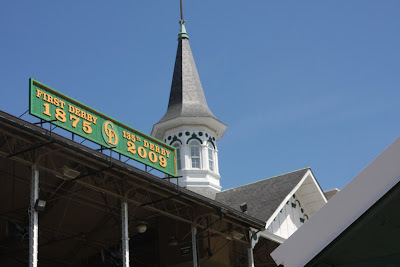 The Kentucky Derby is the first leg of the Triple Crown horse races. It’s known as the “Most Exciting Two Minutes in Sports”, and is the oldest continuous sporting event in the United States. I grew up surrounded by traditions leading up to the race. In elementary school we would make our own stick horses, decorate “silks” (construction paper vests), and then at the end of the week we’d have our own races. I also remember, come Derby Day (first Saturday in May), my parents and my brother & sister would watch the races on TV, and my parents would give us quarters to make our bets. I always chose the horse with the neatest sounding name. I always lost. Still to this day I get chills of excitement come race day when I hear the playing of “My Old Kentucky Home”. It’s such a fun tradition, with the festive hats & festive drinks. 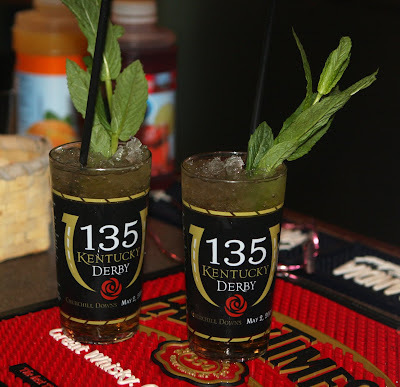 The festive, traditional drink served at the Derby is a Mint Julep. It consists of bourbon (Early Times is the offical bourbon, but I had Maker’s Mark on hand), mint leaves, and sugar or simple syrup. I happened to get the chance to go to Opening Day, where I had my VERY FIRST, Mint Julep, and I got a commemorative glass for this year’s race. 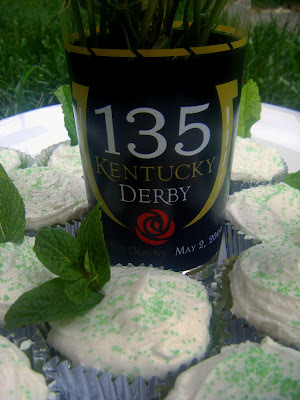 I’ve had my eye on these cupcakes since before Derby last year. I finally made them this year and I’m SO glad I did. I took them into work, and they were gobbled up VERY VERY fast! Not just that, but lots of people seemed to go out of their way to tell me how good they were! While the cupcakes didn’t capture the TRUE flavor of a Mint Julep (think LOTS more bourbon! ), they certainly were inspired by it. As a bit of advice warning, I have heavily re-written the original cupcake recipe from it’s source. For one thing I halved it to make closer to a dozen. And for another, the original recipe calls for the eggs, but never mentions when to add them! Luckily, for some reason I felt something was off, and I did a “test batch” of two mini cupcakes and discovered this mistake. And the frosting recipe I changed up quite a bit too, adding bourbon to that, as well as using softened butter, instead of melted, as I’ve NEVER seen or used a frosting recipe that required melted butter, and I just didn’t feel like chancing it this time! Preheat the oven to 350F, and grease or line cupcake cups. In a large bowl, combine the flour, baking powder, & salt. Set aside. Whip the butter & shortening using the whisk attachment (if available). Slowly add in half the powdered sugar. Add in the extracts & bourbon. Add the rest of the powdered sugar. Then slowly add in milk until frosting reached desired consistancy. 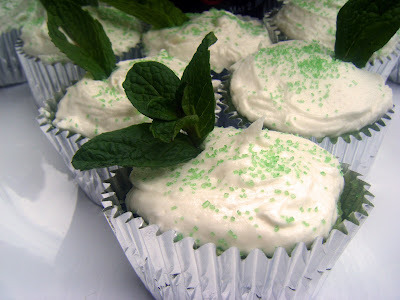 Once cupcakes are completely cooled frost, and top with mint leaves (optional, for decoration!). What a fabulous cupcake flavor for derby days!! love this idea! i have lots of mint in my new herb garden. I love it! I’ve got to make these! These sound so good Erin! 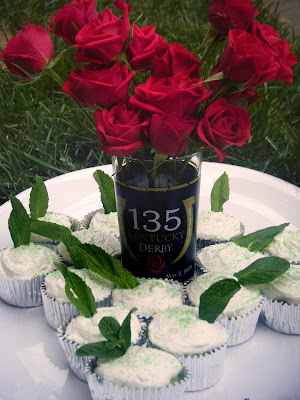 If I have time, I just might have to make them for our Derby Party this weekend! What a cool idea for a cupcake! I love your fresh mint garnish. booze, food and mint…all in one yummy package. Cool 😀 I am not into horse racing but who hasn’t heard of the derby! I had a recipe recently almost do the same thing to me. Luckily I try to have everything in place and noticed that the butter was still left. It worked out in the end. Your cupcakes look great. Love the green sugar and mint leaves. Wow! Look at those beautiful cupcakes! Thanks for stopping by my blog today, Erin. It’s great to find yours. I’ll be following. 🙂 I love the idea of alcohol in cupcakes, too. In fact, did you see my Long Island Tea Cupcakes, Kentucky Style on the blog? I’m making mint juleps tomorrow for THE DAY. Wish you were close enough to have a sip! p.s. Are you an Iron Cupcake baker, too? It was so funny to read how you felt when Derby time came around and what you did as a kid. Only a fellow Kentuckian can understand those feelings! I have a stupid question-how and when do you add the bourbon and creme de menthe? Totally not a stupid question! I can see it’s easy to miss. In the second paragraph it says ” Add the milk and liquors to the batter, then the rest of the flour.” So by “liquors” I meant the bourbon & creme de menthe. Hope that helps!